Scarce pocket map of Chicago. New Guide Map of Chicago. Abraham Lincoln Presidential Library, GZ896 C53 (1875) A834. An extremely rare 1876 pocket map of Chicago, Illinois by the Anders M. Askevold. This Chicago published map covers from Central Park in the west to Lack Michigan in the east, and from Lincoln Park in the north to Union Stock Yards in the south. City wards are numerically identified and coded by color. All streets, rail lines, parks, important municipal buildings, piers, canals, and rivers are noted. With the completion of the Pacific Railroad in 1869, the 1870s were a period of astounding development, optimism, and expansion throughout Chicago. Despite the seemingly enormous setback of the 1871 Great Chicago Fire, the city's growth barely slowed. This decade witnessed the implementation of the city's 'boulevard' system and the inauguration of parks along the lakefront, Lincoln Park, shown here, being the best known example. 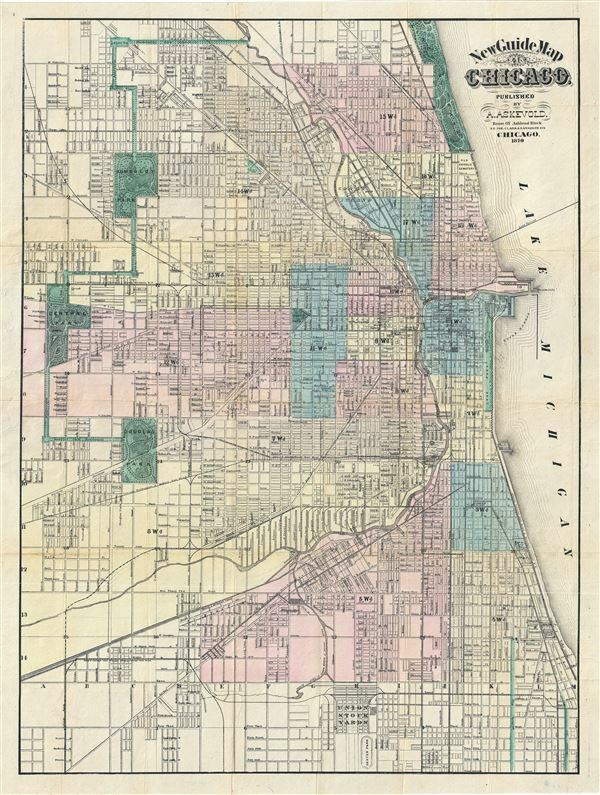 The 1870s and 1880s also fostered the rise of the Chicago as a center of map publication. In this Aksevold was a pioneer and his work is among the earliest and scarcest Chicago based cartographic work - especially compared with the mind-boggling volume of later Chicago publishers like Rand McNally and George Cram. The OCLC identifies only two known examples, one at the University of Illinois at Urbana-Champaign Library, and a second in the Abraham Lincoln Presidential Library. There is a third example and the only known example of the 1876 edition. Anders Madsen Askevold (January 16, 1842 - August 16, 1901) was a Norwegian map publisher based in Chicago Illinois in the late 19th century. Askevold immigrated from Valkryien, Bergen, Norway to Quebec on May 25 1968. From there he made his way to Chicago where he established the firm 'Merchant's Lithographers' in 1870. This firm was unfortunately destroyed just one year later in 1871 by the Great Chicago Fire. We have found no examples of cartographic work printed by Anders during this period, but the Library of Congress does mention the firm as a publisher of panoramic maps. Afterwards he partnered with Peter Roy, to found the Chicago Map Establishment located at 67 Ashland Block, Chicago. After 1875 or Askevold may have acquired Roy's shares in the firm as from this point on he is listed sole proprietor. This firm published at least 10 different maps, most of which focused on Chicago and Oregon. The connection here is unclear. He returned to Norway from 1880 to 1888, where he printed at least one map of Bergen Norway, before returning to Chicago and resuming a publishing career in April of 1889. He remained in business until about 1898, the date of his last known publication. Very good. Rremoved from original blue paper binder (included) and backed with archival tissue for stability. OCLC: 25972277. University of Illinois at Urbana-Champaign Library, G4104.C61878 .A8. Abraham Lincoln Presidential Library, GZ896 C53 (1875) A834.